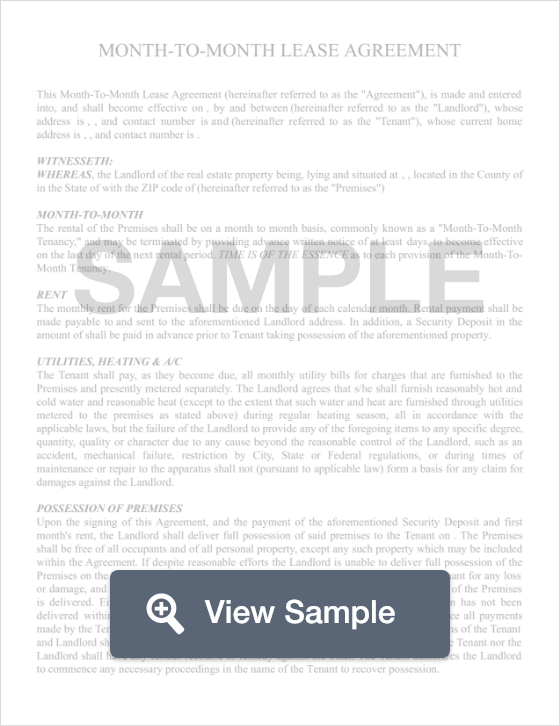 What is a Tennessee Month to Month Lease Agreement? Tennessee Month to Month Lease Agreement: What Is It? In the state of Tennessee, a month to month lease agreement is a legal document that landlords use to officiate a monthly lease agreement. These documents differ a traditional long term leases in the sense that they do not require a long term commitment but are open-ended, offering little commitment but can extend for as long as needed. Month to month agreements are very similar to their long-term counterparts, differing mainly in commitment time. Otherwise, they contain the same pertinent information found in a long term lease such as rent amount, due date, late fees, rules of occupancy, parking, laundry, etc. When either the landlord or tenant wants to terminate the lease, a simple termination letter will suffice so long as it is delivered in sufficient time (according to Tenessee Law), and is in writing with all the pertinent information. The state of Tenessee dictates that anyone who wishes to terminate a month to month lease agreement must do so in writing, and at least 30 days in advance. It is important to note that the only individuals who can effectively terminate a lease are those listed on the lease, and the landlord or property manager.